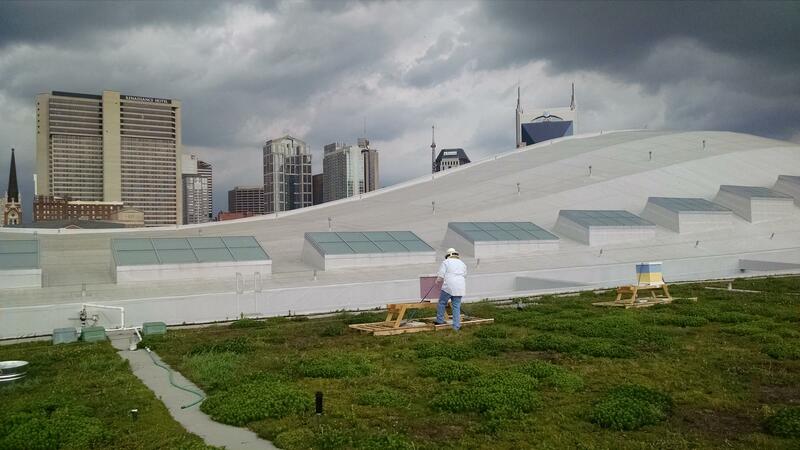 Volunteer beekeeper Jamie Meredith checks a hive on the Music City Center's green roof. Eight stories above Nashville's SoBro neighborhood, beekeeper Jamie Meredith gently works a wooden frame free from a small box. He holds it up, showing hundreds of bees on this frame alone. Many have their heads buried deep in a honeycomb. "You can see that it's filled with honey," Meredith says. "And they seem to be doing really quite well." Meredith, a stout, sunburnt farm boy from Kansas, earns his living designing websites, but raises chickens and bees in his spare time. 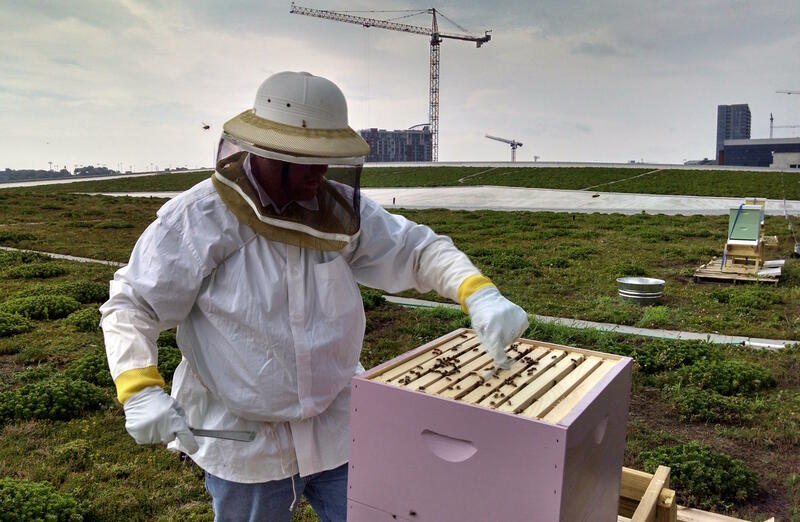 So when the Music City Center decided to install hives atop its 4-acre green roof, a friend of Meredith reached out to him. He quickly volunteered. The idea is borrowed from a convention center in Vancouver and is the latest effort to burnish the Music City Center's reputation as eco-conscious. MCC Chief Executive Officer Charles Starks says the bees should aid pollination among the roof's 16 varieties of sedum. But, more importantly, they'll produce as much as 360 pounds of honey a year, which the Music City Center will use in its kitchen and give away as promotion material. "We want to use as many local ingredients and products as we can," Starks says. The investment in beehives was small — only a few thousands dollars from local vendors — and Meredith checks on the bees every few days free of charge. The hives are part of a broader effort by the Music City Center to be eco-conscious. Since the bees were installed in late May, they've doubled in number to about 100,000. He hopes the hives add at least that many more. "Urban apiaries do extremely well," he says. "They actually do better than apiaries out in rural areas." He cites a lack of competition. That's despite an abundance of food, much of which comes from ornamental plants. "You know, all of them might have flowers out on their decks," Meredith says, pointing out the high-rise apartments and condos in the nearby Gulch neighborhood . "The bees will absolutely utilize that as a nectar source." The hives have been painted in flowery pastels. The color scheme is meant to help bees find their way back home after ranging as far as a mile in search of food. "They only see certain wavelengths of color. They don't see color like we do." As he gently opens each box and handles their combs, Meredith wears a helmet draped in mesh and long gloves — precautions he says he doesn't see as strictly necessary. He asks if I'm allergic to bees before taking me near the hives. I'm not, and as he works, I stand a foot or so away without any protective gear. The bees ignore us both. "Bees typically don't like to sting. I mean, it kills them. And they know it," he says. "They prefer to just live in harmony. Which is what we all want, right?" The bees are generally far away from people. Besides he and a few other Music City Center workers, no one ever comes on the roof. However, these bees are not alone. "You know, we're adding, what, maybe 200,000 bees to 20 million that exist in downtown Nashville," he says. "They're just so easy to miss unless you know what you're looking for." No one paid much attention to the 400-foot-deep pit at the edge of the Nashville International Airport complex. Not until the 2010 flood, says Christine Vitt, the airport's head of strategic planning and sustainability. 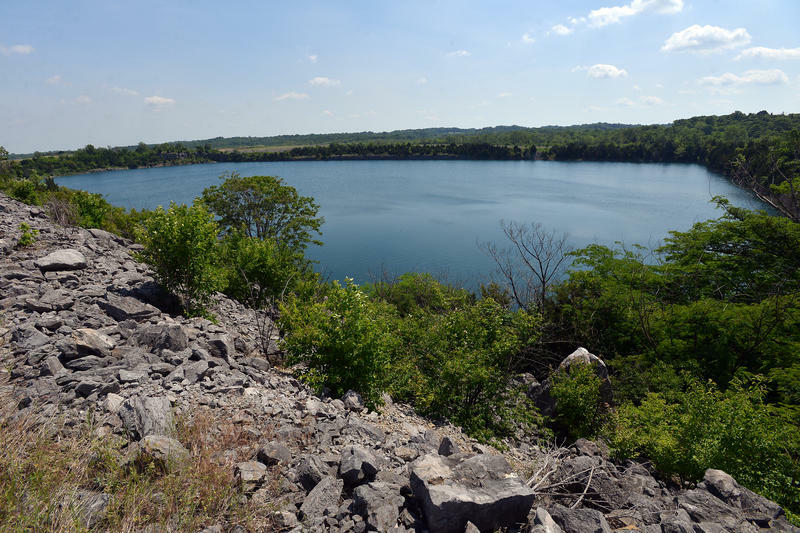 That's when the abandoned limestone quarry overflowed for the first time ever. "And we had the energy consultant there, who said, 'Well hey, maybe there's a win-win here,'" Vitt recalled. Five years later, that thought has led to a plan airport officials hope will save as much as $400,000 a year. 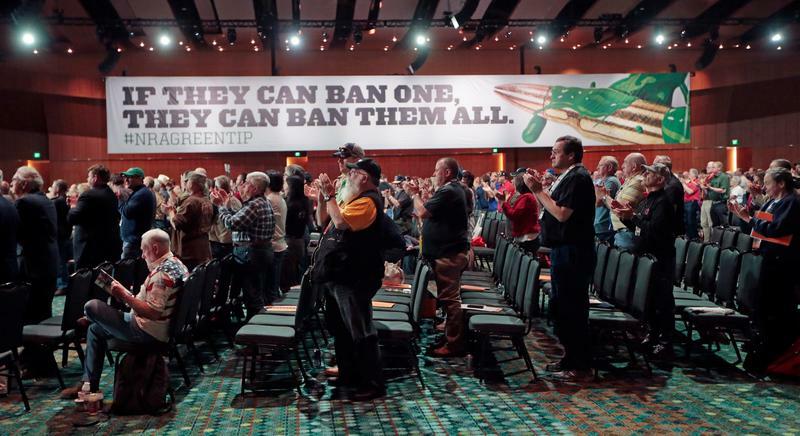 The National Rifle Association may host its annual convention in Nashville on a rotating basis, according to the city’s top tourism official. Nashville Convention and Visitors Corporation CEO Butch Spyridon says the city is on the NRA’s short list to be a regular host. "They would like to maybe find 4 or 5 cities and just rotate among them. And we are in consideration in that 4 or 5," Spyridon says. "We have not submitted anything yet, but we certainly would talk to them."